Few bands have exemplified the maxim “if it ain’t broke, don’t fix it” better than Kalmah. Since 1998, Finland’s answer to In Flames and At the Gates has been machining high-octane death metal with commendable consistency, with a slight turn towards thrash in the middle of its discography. Now on its seventh album in fourteen years, Kalmah seems to have flown under the radar somewhat compared to contemporaries such as Dark Tranquility and Children of Bodom. Perhaps it’s because Kalmah arrived on the scene a few years late, or because they’re from Oulu instead of Gothenberg, but this oversight certainly isn’t due to a lack of quality material. It wouldn’t be hard to make a case for Kalmah’s second album They Will Return being a genre classic, and five of its six full-length efforts are generally held in high regard (with 2008’s For the Revolution perhaps falling short of the rest). So Seventh Swamphony comes with something of a pedigree, as Kalmah’s core lineup of brothers Pekka and Antti Kokko, bassist Timo Lehtinen and über-drummer Janne Kusmin are back for another swamptastic voyage. As evidenced by the album’s lead music video, our titular hero the Swamplord is also back and looking more like Devin Townsend with a hangover than ever. Never a band to take itself overly seriously, Kalmah lives and dies by its reverence of Finland’s primordial wetlands. While its swamp-this, swamp-that M.O. may confuse some new listeners, it’s at least nice to see someone writing about something they’re passionate about. In the end, it’s Kalmah’s relentless melodic attack that justifies its thematic shenanigans. Swamphony’s machine-gun drumming and dazzling twin guitar lines are even more intense than those on 12 Gauge, as lead guitarist Antti sounds hell-bent on proving he still has the warp speed chops he showed on “Hades” and “Principle Hero.” During the recording of 12 Gauge, both guitarists aimed for a more aggressive sound, learning to play with 45-degree angle downstrokes (jynkhä in the band’s native tongue) for maximum punch. The result was a beefier and thrashier album, but on Swamphony they seem to have returned to their previous techniques for crafting swift, intertwined tremolo riffs, while pushing for even more intensity and speed throughout the album. Pekka Kokko’s vocals, while guttural like most death metal, are often rather articulate for the genre. The choruses benefit greatly from the intelligibility of his rasp, as he delivers some tremendous lines on songs like “Pikemaster” (“Why can’t you see / Why don’t you believe / Those days are gone / When you come home”) and the epic “Hollo,” which peaks with Pekka’s devastating growls of “walking away, walking away, I never will return…” The former song is one of three odes to the band’s pastimes of hunting and fishing (“Black Marten’s Trace,” “The Trapper,” “Pikemaster”), and serves to tie Swamphony to its predecessors which featured songs such as “Hook the Monster” and “Burbot’s Revenge.” Things are equally impressive on the instrumental side, with standout performances by the rhythm section of particular note. Rumor has it that Kusmin had to re-write the 12 Gauge drum parts when he realized he was out of practice, and if I didn’t know better, I’d think he was making a point to shut those rumors up with his performance here. “Windlake Tale,” in particular, showcases some of the most propulsive rhythms in Kalmah’s catalogue, pushing past 200 beats per minute over triplet-based percussion and slithering guitar lines. Kalmah means “to the grave,” and the band lives up to its moniker by holding nothing back on Seventh Swamphony. In fact, there are several moments throughout the album that are bound to raise eyebrows among even long-time fans. Following hot on the heels of the blistering title track, “Deadfall” brings a new element to the band’s sound as a full symphonic backing introduces the song’s bridge. We’re not talking single-note keyboard lines like the band’s early days – this is closer to Septic Flesh, even early Dimmu Borgir (“Mourning Palace” comes to mind during the bridge of “Wolves on the Throne”), and the resulting atmosphere is one of the album’s major draws. There are a number of Judas Priest-style solo battles, notably on the aforementioned “Deadfall,” while “Wolves” boasts an extended bass solo by Lehtinen, a welcome change of pace not regularly used by the band in over a decade. 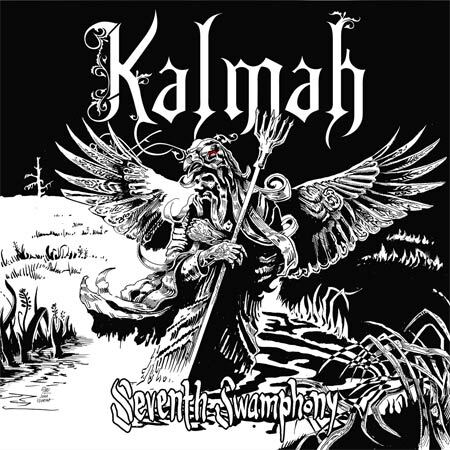 The new additions to Kalmah’s sound create a vitality that runs throughout Swamphony; whileFor the Revolution and 12 Gauge began to run together after six or seven songs, each new piece remains explosive during the album's svelte 41-minute run time. The penultimate song of the album, “Black Marten’s Trace,” breaks things up by opening with an ethereal keyboard solo that wouldn’t sound out of place on a Nightwish album, and then proceeds to lay down some of most viscous riffs in Kalmah’s recent discography. A rising vamp of the title breaks up the verse-chorus form twice during the song, Kusmin ramping up the intensity with each repetition. Leaving Kalmah’s comfort zone even further is the album’s seven-minute centerpiece, “Hollo.” Introduced by a mournful guitar solo over growling acoustic accompaniment, the song marches ominously until the two-minute mark, when things get interesting. Double-bass floods in underneath churning guitar lines, and Pekka comes in with deep but cleanly chanted vocals (yes, you read that right, clean vocals on a Kalmah album). After another verse and chanted section, the guitars break into a synchronized gallop and nigh-heroic chorused vocals surge above the calamity as the song reaches its climax before the acoustic intro returns to wrap things up. From a band often criticized for a lack of diversity, there’s a lot to like in the experimental department on Swamphony. Kalmah may never be accused of being the most visionary metal act, but the band deserves credit for their approach to a genre largely content to recycle itself. Kalmah’s steady core lineup seems to have found an ideal mix of brutality and adrenaline, but continues to separate itself from contemporaries such as Arch Enemy and The Haunted by never being content with that balance. From its thunderous opening riff to the triumphant strut of closer “The Trapper,” Seventh Swamphony is a solid and occasionally surprising affair that’s worth a long look from fans of modern death and thrash metal. If 12 Gauge showed that Kalmah could still run with the pack, then Seventh Swamphony finally has the band leading it.